There is nothing like freshly picked sun kissed berries. 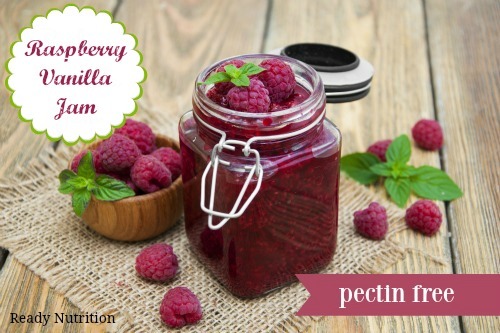 This recipe for raspberry jam is delicious and has a touch of vanilla to intensify the flavors. Happy Jammin’! There is nothing like freshly picked sun-kissed berries. We have a plethora of wild growing berries where I live and I love to preserve them. I tend to draw on more natural based recipes that have been passed down from my pioneer ancestors, like the ones found in my prepper cookbook. After all, past generations didn’t have packets of pectin in their pantries and still their preserves always came out delicious; so this is me paying homage to my people. This recipe for raspberry jam is delicious and has a touch of vanilla to intensify the flavors and doing have added ingredients like corn syrup that you find in store bought preserves. As I was making this recipe the other night, my daughters flocked into the kitchen to “taste test” the jam bubbling away on the stove. What I love most about this recipe is it is so easy and always cooks up with just the right thickness. In a large pot over medium-high heat, add fruit, sugar, and lemon juice. Allow mixture to come to a boil. Mash the fruit with a potato masher and skim off any foam that may form and discard. When mixture has come to a boil, lower the heat to medium and allow the mixture to continue to softly boil for 5 minutes. Tip: Stir regularly to prevent scorching. You will know that the jam is done with a gel forms on a spoon. Remove jam from heat and let sit for a couple of minutes, stirring occasionally. It will thicken slightly. Ladle jam into hot jars, clean rims, then place flat lid on jars, and add screw bands.